Search engine bots have issues reading most web pages. To improve search ranking, implement these tips to make your web page easier to read. Disclaimer: Content is king. Provide value, make yourself accessible, make your website easy to navigate and easy to understand for your users. Everything detailed below is about Search Engine OPTIMIZATION, and is not worth a thought until you have something worth optimizing. Bots need to be able to read your web pages to properly index them. Unfortunately, most websites are uneccessarily hard for these bots to read. Because of this, the bots are forced to make “best guesses” about the content; often causing less than optimal page rank (and thereby hurting SEO). Humans can see web page styles. This allows us to group content and understand each element’s context regardless of the underlying DOM elements. Robots lack this ability. When a bot reads a web page, it ignores all of the styling and uses the HTML tags to understand what it’s looking at. With all of the styling ripped away, and using non-semantic elements (like <span> and <div>), this is what a bot would see. Going off of this structure alone, the bot is forced to make “best guesses” about the context of the page’s content. Do you know where to find the unique content on this page? Do you know which content isn’t relevant? I’m sure you can make some educated guesses. But it’s hard to know for sure. We can use semantic elements (basically “more descriptive <div> tags) to provide context and clarity. But what elements do we have at our disposal? What are the rules that govern when and how we should use them? <main> Represents the main content of the page. There should only be one. You should not place <main> inside another semantic element. <article> Should make sense if distributed outside the context of the page. Can contain other articles. Should have a heading. <aside> Much like a play’s aside, content in an aside breaks away from the normal flow. It is usually related, and expands on something. Commonly contains <figures>, groups of <nav>s and quotes. <address> Should contain the author’s contact information. Author of… the website, of the article, of the comment, etc. The remaining sectioning elements can be used any number of ways so long as their meaning is preserved. For example: your webpage can have a <footer>, but an <artical> can also have a <footer>. 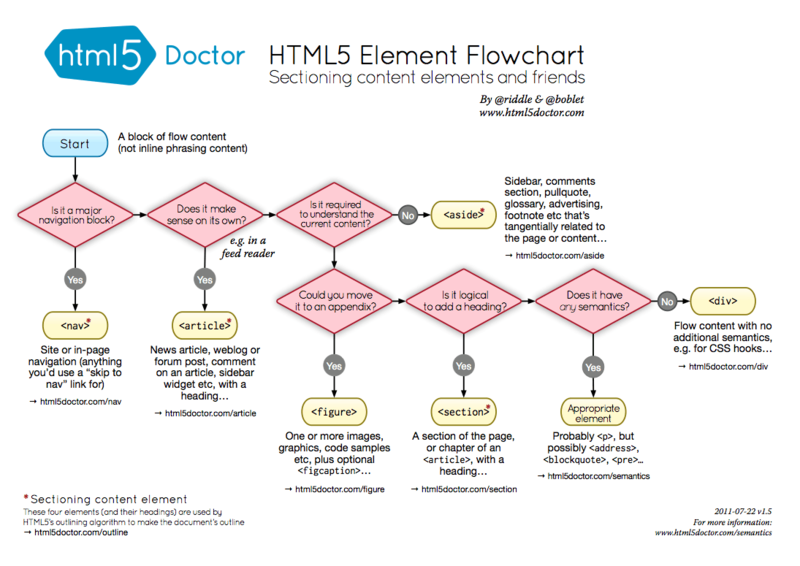 Tree House has a great article that examines each sectioning element, and HTML5 Doctor has a great flow-chart that walks you through picking the right element. Google bots are reading your web page trying to figure out which keywords best correlate with your content. Like humans, they look to the <title> of the document, and at the main headings (<h1>, <h2>, and <h3>). They’ll likely assume emphasized and bold words are important, and that any other web pages you link to are related to your content. It is less common to see these elements missused. Switching out an <aside> with an <article> makes no visual difference, but swap a hyperlink <a> for <span> and you will immediately notice. HTML5Doctor has a list of all HTML elements, as well as descriptions and examples of how and when to use them. Actually… The newest W3C spec for WebComponents leaves room for programmers to create their own DOM Elements. Projects like Google’s Polymer seeks to implement the new spec, and groups like webcomponents.org are helping facilitate discussion and education on the topic. Why should I take the time to care about Semantic Markup? Going through your application and replacing lame duck <div>s with cool, hip-happenin’ Sectioning Elements is a quick process. It nets you increased SEO, makes your website more accessible to modern screen readers, and you’re creating easier to maintain code. What does a google bot look like? Your website’s metadata is important. It tells social websites how to format specific pages when they’re shared, it helps to further define your page’s keywords and relevance for SEO, and so. much. more. 👋 Hi! I’m Danny. I live in Dublin, Ohio and I work remotely for Asteris, Inc. I develop progressive web applications that enable veterinary medical images to be used for diagnosis from any device, anywhere.